Do you struggle with finding good Christmas gifts for married couples? In some ways, you’d think the shopping process would be easier; you’re combining two gifts into one! But it isn’t always so easy. We’re here to help. As a married couple ourselves—and a couple that absolutely LOVES gifts—we’ve put together a list of items that could be excellent for any couple on your list. These should appeal to both members of the duo and be useful, fun, or beautiful. 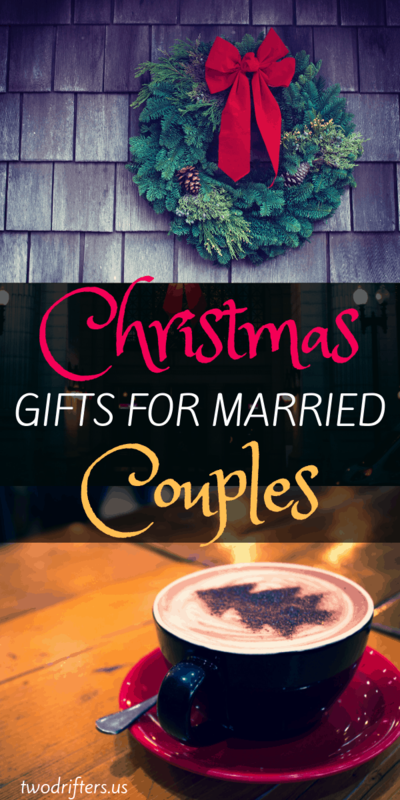 So look no further, we’re chock full of Christmas gift ideas for married couples. Let’s start shopping! Okay, this isn’t maybe the most *exciting* of gifts, but have you ever tried an electrical kettle? If you know someone who likes to drink copious amounts of tea (or who just would appreciate it if their water boiled faster) an electric kettle is a terrific gift. We grew to love the electric kettle when we spent time in the UK, where they are extremely popular. Here in the states, it seems a lot of people are still making tea on the stovetop. Well, an electric kettle is lightning fast and super convenient. We are obsessed with ours. (Pssst: this is the exact one we have and it works like a charm). I’m almost certain one of the married couples you know would love an electric kettle. A stunning holiday wreath is a great present for married couples because it is a high-quality gift that will make their home extra festive. This L.L. Bean Lighted Tartan Christmas Fir Wreath is so classic and Christmassy. Amazon has some pretty wreath options as well. It’s almost guaranteed that your couple drinks coffee. After all, it’s one of the most popular—and delicious—beverages. Let them have a bit of coffee luxury at home with a Nespresso machine. Here’s one that comes with an attached milk frother, so making lattes and cappuccinos at home has never been easier. A classic espresso maker is also a wonderful choice, and it’s often something that people love to receive as a gift, but would never think to purchase for themselves! We always recommend tents as a great gift for couples; at least for those couples who will actually use it! This is a gift that will give adventurous couples endless years of use. For your camp-loving duo, we recommend a 2 or 3-person tent. A few good options? The Cotopaxi Inti 2 is the tent we use, and it is awesome; extremely sturdy and warm. Also check out the Coleman Sundome and the MSR Hubba Hubba NX 2-Person Lightweight Backpacking Tent. When it comes to Christmas gifts for a married couple, you can’t go wrong with cozy, snuggly items. Warm and colorful blankets are a gift that nearly everyone appreciates. And at Christmas time, there are endless, adorable options. One of the simplest gifts for married couples is a set of picture frames. There are so many varieties and styles, and today’s frames can be ornate and special, not just something run-of-the-mill. Picture frames are especially perfect Christmas gifts for newlyweds, who are likely setting up house and need plenty of frames to display their newly-printed wedding photos. Take a look at this sweet Family Tree Wall Hanging for just one great picture frame idea. For some couples, personalized items might be too cheesy, but for others, it is absolutely the perfect gift. This could especially be the case for newlywed couples, who are oh-so-psyched about their new status as Mr. & Mrs. Uncommongoods has so many terrific ideas for personalized things for couples. Among the gift possibilities include personalized cutting boards, a serving tray with a map of somewhere they love, and mugs adorned with their names. Amazon has personalized items as well, including this cute photo of street signs bearing the names of your choice. This gorgeous copper growler from uKeg keeps draft beer fresh for up to 2 weeks. If your couple brews their own beer or just likes to sample the local craft selections, this is a fabulous gift. Other possibilities for beer fans: A refrigerated case to hold a bunch of cold beers (and wine!) at the ready, or a home brewing starter kit. Looking for gifts for a Christian couple? Here’s something that is special and meaningful: an advent wreath. Your couple can light one of the four candles for each Sunday of Advent. This gift provides something that a couple or a family can do together during the Christmas season. There are so many choices for gorgeous wreaths, but we find the Silver Ribbon Advent Wreath especially beautiful. These days, you can get a subscription to practically anything, which makes gift giving a whole lot easier. 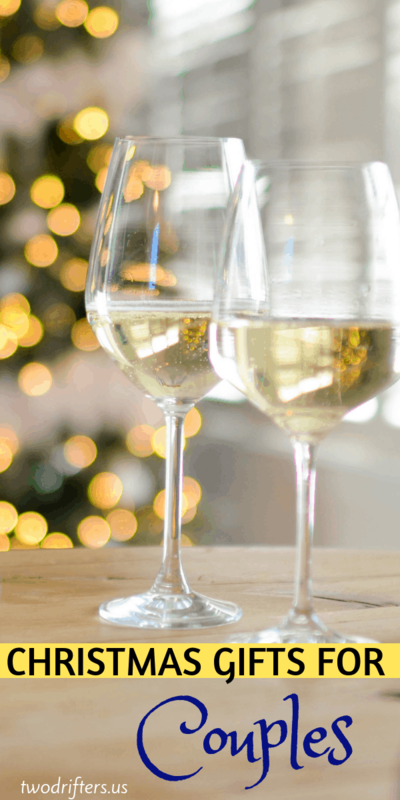 With a service like Bright Cellars, you can gift your couple a specific amount of wine, for a few months up to a year, and they get to go online, fill out their “flavor profile,” and get wines they’ll love delivered right to their door. Our Moments Couples is a game that is filled with fun, unique conversation starters for couples. The questions are thought-provoking, sparking new discussions you may not have had before, so couples can learn more about one another. This is a great Christmas gift idea for newlyweds or for couples who have been together a long time. They can use it for date night, or even on a long road trip. Looking for Christmas gifts for a young married couple? Personalized husband and wife pillowcases might be the ideal present. Amazon has so many options, ones that say Mr. & Mrs., Morning Gorgeous & Hello Handsome, and a whole lot more. Nothing says classy and “adulting” like wine and cheese. This cheese board offer everything a couple will need for a night of most excellent hosting. Pair the board with a bottle of wine and some fresh cheese and you’ve got a straight up awesome couples gift idea. Subscription boxes are all the rage these days. Who wouldn’t love something cool (and romantic) arriving to their door every month? You can gift your favorite couple a few months of dates delivered right to their home. One option we recommend is Crated With Love, which is an affordable option that has a different monthly theme with each box. With our link, you can get $5 off your first box. You can read our review of one of their date night boxes here. Do you know a couple that loves to travel together? This book by our friends at HoneyTrek is the perfect inspiration for a jet-setting duo. Ultimate Journeys for Two provides so many unique and romantic destination ideas, and covers every continent. 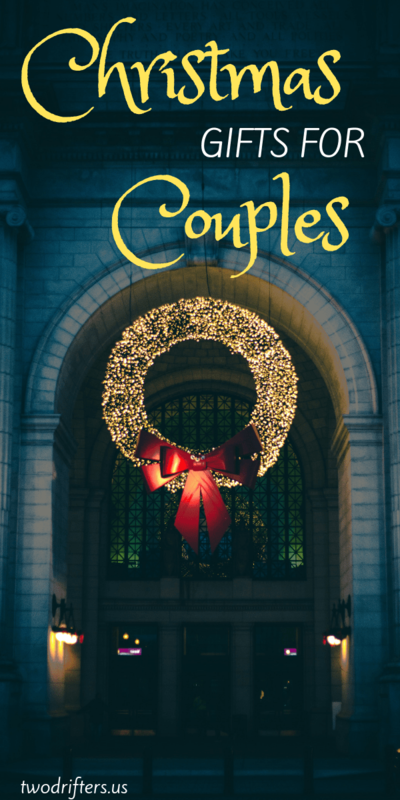 This book is a best-seller in the Honeymoon Travel Guides category, so it is doubly perfect if you’re looking for a Christmas gift for an engaged couple. Help them plan their honeymoon and make it amazing with this resource. Great ideas! My hubs gave me a Dreamlines sketch of my dress and his suit. The detail was amazing. Brought me to tears. A perfect present. aww wonderful! what a sweet gift idea. I’m glad you like our suggestions 🙂 Merry Christmas!